In his fifth guest article on Visible Banking, Daniel Gusev – (newly former) Head of Innovation at PSBank – talks us through the Russian bank’s launch of the self-proclaimed ‘word’s first crowdsourcing card store’. On 4th February 2012, we turned 5 on that date, I announced the launch of the ‘Visible Banking Stars‘ programme as well as the total redesign of VisibleBanking.com. If you are interested in joining our exclusive group of guest bloggers -all bankers, insurers and financial services professionals working in digital / social media / innovation- I invite you to email us. I am delighted to publish another insightful article from my friend Daniel Gusev – Founder at FinFit. 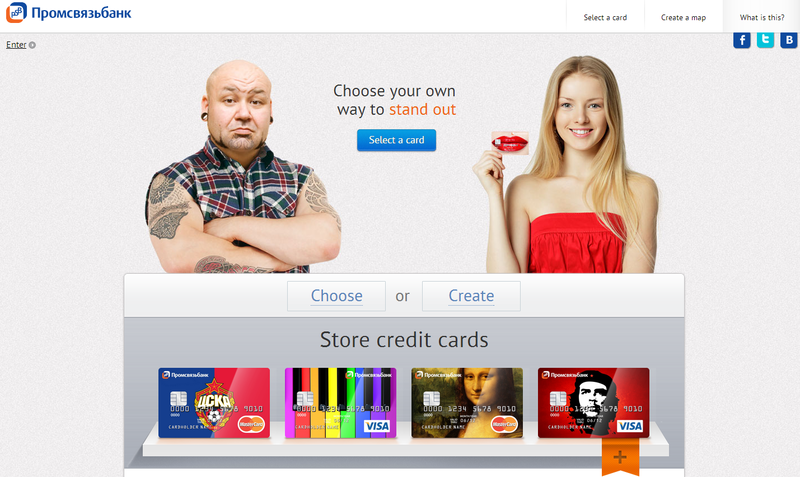 In this article, Daniel sheds some light on PSBank’s recent launch of an innovative crowdsourced credit card store. This summer I’ve moved on from heading the Innovation Hub, a specialist design-driven team inside Russian PSBank, created more than a year ago to a great success, to lead a startup by the name of FinFit – a despite the crazy days of fostering this new child, I still remember several projects I curated – and each marketing event by the Bank asks for a speech on how did we manage to achieve such clarity of view. I would like to kindly use Christophe Langlois’s Visible Banking to talk about two projects that, now public, exemplifies my deep belief system in everything social and how social should be part of a bank’s internal and external offerings. A social experiment that is considered by the bank a good success, is the late summer launch of the world’s first crowdsourced card design shop: ‘My Card‘. It reimagines the concept for personalized design card order – though the lens of designers – who are the driving force for the design to be bought in the first place. Most banks in Russia dallied with personalized design since probably 2006 – to little effect on card sales, yet what they all had was a standard selection of designs to chose from. This conformity made the service irrelevant, and the selection process unappealing to customers. Even one-off announcements of new pictures to consider were missed. the selection process: it has to be interactive – a motion flow of new images, where most popular are shown at the beginning of the page: a card themed Pinterest carpet – and that was done to great success from both designers and users alike. The bank has integrated a set of popular social network buttons (including Pinterest it drew inspiration from) for people to go viral about cards they did like and ordered – to demonstrate the overwhelming success of the site, the average time of more than 100K visitors in the first weeks was more than 5 minutes, without any ad campaign apart from social media community that drew in most of the traffic. I believe that PSBank has seen great beginning with the service by understanding the fabric of a great social service: viral, interactive, clean, playful. Done by a great team of people. If it is not the firs time a bank coupled a ‘design your own (debit/credit) card’ service with a social media challenge, to my knowledge it is one of the first times they urge their banking customers to participate and promote their effort with a financial bounty. Innovation Mgr in respect of remote channels strategy & emerging payments platforms. Honed knowledge & skills on mobile & proximity payments payments schemes, offering advice on traditional (ATM, Internet) & new ways of offering transaction services to top-10 banks in Russia.